I’m sharing this post from Episcopalian priest Mike Angell’s blog, one of my new favorites. Wishing all those who celebrate Holy Week and Easter a blessed time of reflection and renewal. While searching for a link to explain the Blessing of Animals a few weeks ago, I stumbled on a delightful site: http://www.letallcreationpraise.org/home. Let All Creation Praise is an ecumenical Christian group—that is, one that welcomes all denominations—which is focused on raising awareness of environmental issues and the role of Creation in worship. As “praise” goes hand in hand with “thanksgiving,” it seems an appropriate topic for the week before Thanksgiving is celebrated here in the U.S. When I was working full time, Thanksgiving was always my favorite holiday. We live too far from family to mess with travel, so it was basically a very long weekend with to do nothing but eat and rest up (and read!). Like bears preparing to hibernate. Psalm 65:13 “The pastures are clothed with flocks; the valleys also are covered over with corn; they shout for joy, they also sing.” (King James version) Here we see a sensitivity to nature and to the earth, that even something as lowly as dirt and grass is a fellow creature to be honored and respected; that the earth itself is capable of expressing joy. 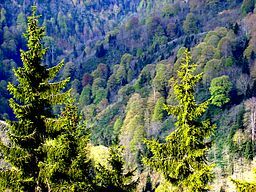 Both Psalm 96 and a verse in the history recounted in Chronicles talk about trees “singing for joy.” Likewise, the book of the prophet Isaiah speaks of trees “clapping their hands” (Isaiah 55:12 )–one of my favorite passages. 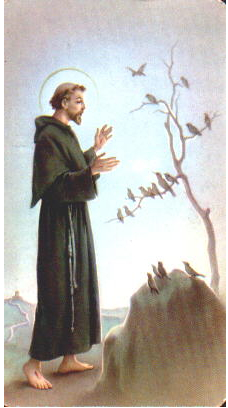 Saint Francis is, of course, the most famous exemplar of Christian love for creation. His Canticle of the Sun expresses the notion that all facets of creation are the brothers of humankind. Legend has it that he preached to the birds and saved (and “reformed”) a wolf whom villagers were about to kill. In the 20th century, C.S. Lewis, quite possibly the most influential Christian of modern times, wrote in his autobiography Surprised by Joy of the joy and refreshment he found in the natural world. More recently, farmer-poet Wendell Berry‘s novels, essays, and poetry show a Christian worldview where nature and the fruits of the earth are central to the spiritual and moral life. To return to the group that prompted these musings, on its website “Let All Creation Praise” states: “We seek to serve the whole church by providing resources for Christian worship that promotes love of and care for God’s creation.” The organization “offers resources for congregations to celebrate God’s love for creation, to worship God with creation so as to reconcile and restore our human relationship with the rest of nature, and to foster love and care for God’s whole creation. We also provide resources to celebrate a “season of creation” or “creation time” in the church year.” In a world where human greed threatens to overtax the climate and natural resources of our fragile globe, it is heartening to see this kind of endeavor. Reverence for the earth should not be seen as competition for the reverence of God, but as its natural consequence. My short story “The Black Cat” won this year’s Halloween short story contest sponsored by the online magazine Kings River Life, where it was published last Saturday. If you’re curious, you can read it here. I wrote the short story last fall, my first “creation” since leaving the day job, but the idea had been kicking around in my head for a while. Shortly after I decided to experiment with self-publishing a Christmas short story, “Saint Nick and the Fir Tree,” which appeared in December 2011, I got the idea of writing other holiday-themed stories featuring Saint Nick. I’ve always loved Halloween (I grew up watching Dark Shadows and reading Edgar Allan Poe) and I love cats, so writing a Halloween story that featured a black cat was an appealing notion. I decided to frame the story by setting the first part on the Saturday night before the Feast of Saint Francis, which many churches celebrate with a Blessing of the Animals. The feast day proper of the much-beloved saint is Oct. 4, and the Blessing of the Animals usually takes place either on that day or the following Sunday. The last part of the story takes place on Halloween. While my Christmas story featuring Saint Nick cast him as the original saint—aka, Santa Claus, in “The Black Cat” Nick appears merely as a “regular” human, a kind man but shrewd, his personality toned down somewhat from the occasionally crotchety Saint Nick of my Fir Tree story. (“Saint Nick and the Fir Tree” takes place the day after Christmas, when Nick is in search of a much-needed vacation, so his crotchetiness is quite understandable!) The black cat herself has another inspiration, but to discover that, you’ll have to read the story. 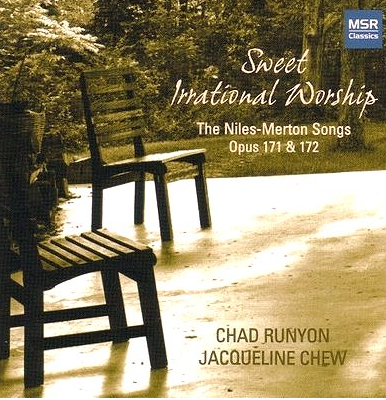 It describes Merton’s meeting with composer John Jacob Niles, who had already set many of Merton’s poems to music, and goes on to review a then-new recording of Niles’ Merton song cycles sung by baritone Chad Runyon. A quick search of the Internet shows the recording is still available. I couldn’t find any audio excerpts of this particular song, but the singer’s website includes samples of several others on the album. Baritone happens to be my favorite category of voice, and any composer sensitive to the nuances of Merton’s poetry is one worth checking out: I intend to order it soon. I was also happy to stumble upon the Overgrown Path blog, which looks to be a thoughtful collection written by a kindred spirit. 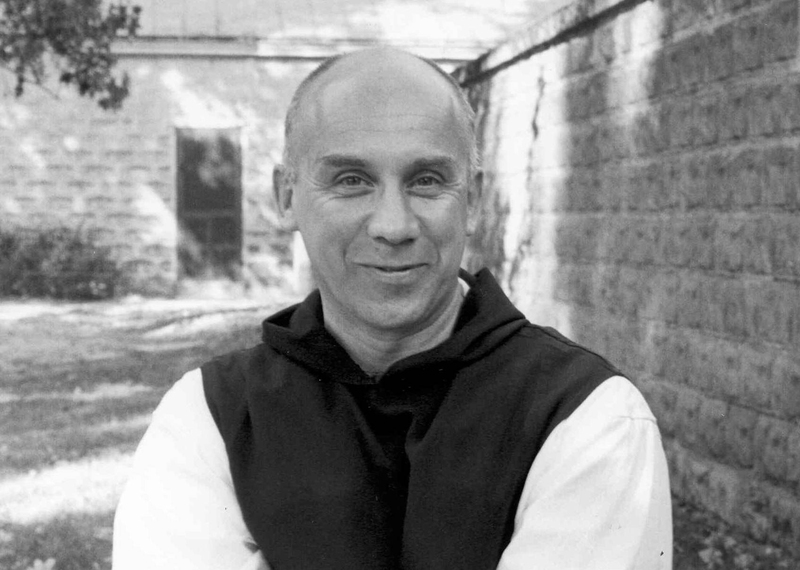 After last week’s post on Thomas Merton’s poem “O Sweet Irrational Worship,” I was contacted by the organizers of a Merton conference, “Coming home and going forth: Merton as mirror and model,” to be held June 19-22 on the grounds of Saint Bonaventure University, in Olean, NY, where Merton briefly taught before entering the Trappist monastery outside Louisville, Kentucky. The paragraphs below are taken from the conference’s official press release. Sarah DiPofi of the Travers Collins public relations firm was kind enough to bring the conference to my attention. The three-day event at St. Bonaventure University will celebrate the relationship between St. Bonaventure University and Merton in anticipation of Merton’s 100th birthday in 2015. Speakers include America magazine columnist Fr. Dan Horan, O.F.M. For schedule and registration information, visit http://www.sbu.edu/merton. While Merton’s time in Western New York was brief, his experiences at St. Bonaventure, from the time that his friend Robert Lax brought him to Olean to his days in Devereux Hall, were influential in his life’s journey. Merton’s autobiography “The Seven Storey Mountain,” regarded as one of the 100 best non-fiction books of the 20th Century, reflects on his time at St. Bonaventure University. Through keynote speakers, worship experiences and tours, the conference will explore the relationships Merton had with the people and places of St. Bonaventure. In addition to Father Horan, renowned Merton scholars on the schedule include William H. Shannon Chair in Catholic Studies (Nazareth College) Christine Bochen and professor of religious studies and vice president for mission and Catholic identity at Sacred Heart University Michael Higgins. Conference coordinator Julianne Wallace says the conference theme harkens to Merton’s calling to religious life: “Merton’s spiritual home was the Abbey of Gethsemani, the bells of which called him to pursue monastic life. 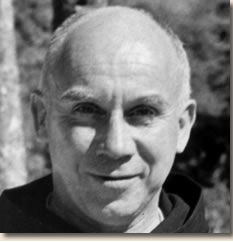 We echo that call with this conference invitation to gather current and future Merton enthusiasts to continue to learn from and build upon the tremendous spiritual and intellectual gifts he gave the world.” Wallace is the director of faith formation, worship and ministry at St. Bonaventure. Visit www.sbu.edu/merton for the schedule of events, speaker biographies, and conference registration information. Follow the conference preparations and latest news on Twitter using #MertonMirrorandModel. The nation’s first Franciscan university, St. Bonaventure University cultivates graduates who are confident and creative communicators, collaborative leaders and team members, and innovative problem solvers who are respectful of themselves, others, and the diverse world around them. The University is establishing pathways to internships, graduate schools and careers in the context of our renowned liberal arts tradition. Our students are becoming extraordinary. I hope some of you will be able to attend. It sounds like a fascinating event! The entire poem can be found here. The poem begins very simply, reflecting perhaps Merton’s interest in the radical stripping away of the extraneous, which he found in Zen Buddhism as well as in certain mystical paths of Western Christianity such as that of Saint John of the Cross (known for his meditations on “the dark night of the soul”). In the line “By ceasing to question the sun,” I believe Merton is describing a path to mystical contemplation in which we let go of the rational, analytical part of our mind and simply experience the present: the sun, the wind, the bobwhite (not a generic “bird” but a specific creature). If you go still long enough and just let yourself experience these elements of nature, you may perhaps enter into a mystical union with them as Merton did in the encounter he depicts in this poem: becoming the light, the bird, the wind. In the next line, Merton moves beyond this to a more universal identification with the natural world. His “leaves sing” as if he were a tree, and then he moves on to a yet greater epiphany: “I am earth, earth. All these lighted things grow from my heart.” By identifying so completely with the natural world to the extent that he experiences a kind of mystical oneness with it, Merton then perceives the interconnectedness of it all, of all the “lighted” things: things that share in the universal condition of being lit by the sun, things that also share in the universal light of the love and creativity of God. And then more than this, a connection that shares not merely the same experiences, but one that has gone beyond this to take on a sense of responsibility, of a deep inward tie so that for a mystical moment, all creation seems to grow from his heart. And in fact, perhaps it does, just as in Roman Catholic theology the blood and body of Christ transmute into the wine and bread that Christians take in the mystery of Eucharist. I fancy that more conservative Christians would frown on the poem as veering towards pantheism, nature-worship, but that is to ignore the deep, worshipful response that nature inspires in so many people, across so many eons and cultures. As I mentioned last week, it was C.S. Lewis, certainly no “liberal” (and certainly no “conservative,” either, but a “mere” Christian), who wrote of the deep joy that nature inspired in him, and of how it pointed the way to his certainty that a transcendent element exists. Reverence for the earth is urgently needed, now more than ever, when we humans are on the verge of destroying the beautiful world that people of religion believe was made by God, not merely, I would argue, for its utilitarian value, but for its beauty, its joy, and for the opportunity to share fellowship with other living creatures that are so different from ourselves such as Merton’s bobwhite and pine tree. In this final image, the bobwhite, Merton, and the earth itself are inextricably linked, so that Merton’s heart becomes the earth, an emptying of a self that now has no name. The poet’s heart is the humble, lowly matter of grass and weeds, the setting and habitat for the bobwhite, who is now linked with Merton the monk in an act of thanksgiving for life, the act of “foolish” worship, worship of the One in whom both poet and bird live, move, and have their being. Anyone who knows me face-to-face knows that I’m as far from a fashionista as it is possible to be. I dress for comfort, wearing the same sets of clothing week after week: cords/jeans, knit top, and usually a sweater, in a color range chiefly confined to black, brown, blues, and greens. But recently I watched a film on fashion photographer Bill Cunningham which touched me deeply: Bill Cunningham New York (directed by Richard Press, 2010). For over 30 years, Bill Cunningham has produced the weekly New York Times feature “On the Street.” As the title suggests, Cunningham’s work chronicles in photographs the street life of the great city, typically organized around a common sartorial theme. Each week’s theme arises naturally out of Cunningham’s observations, something that suddenly seems omnipresent to his trained but impartial eye: things such as a particular T-shirt graphic, a certain color, a distinctive style of shoe that everyone seems to be wearing. While his subjects include fashionistas, celebrities, and socialites, Cunningham’s lens makes no distinctions of class. His modus operendi is to simply photograph whomever happens to strike his eye, whether rich or poor or in-between, whether flamboyant cross-dressers or “ordinary” people going about their daily affairs. “Self-effacing” isn’t the first adjective that comes to mind when speaking of the fashion world, yet that is how Bill Cunningham comes across as the documentary’s crew follows him on his daily rounds, an impression that is only reinforced by the film’s direct interviews. Self-effacing not in the usual sense, which implies a degree of self-consciously holding back, but naturally so. His existence, in fact, strikes me as downright monastic. At the beginning of the film, Cunningham lives alone in a tiny little closet of a room jammed full of file cabinets containing archival negatives and magazines, his only personal space a bookshelf or two and a small bed. (By the end of the film he has moved into somewhat larger digs because the building’s owner has decided to convert the old apartments into office space.) Every morning he gets up to ride his bicycle through the streets in search of people to photograph, a mode of transit which allows him the optimum mobility for navigating the city and the optimum flexibility to stop and shoot whomever happens to catch his eye. Unlike his subjects, Cunningham’s dress reflects the same monastic traits of simplicity and self-effacement as his living quarters and means of transportation: typically attired in casual pants and a smock-like blue jacket. Like the true monk who has found his vocation, Cunningham exhibits unadulterated joy. His existence is focused solely on celebrating others with no concern for self. His delight in fashion comes from his delight in noting the ways that people express themselves artistically and aesthetically through their clothing; there is not the least trace of snobbishness in his attitude. With true wisdom, he says that for many of his subjects, clothing is their “armor to survive the reality of everyday life.” Near the end of the film, he states: “He who seeks beauty will find it.” That is his mission in life and quite obviously the source of his great joy. Early on, Cunningham displayed a strong sense of ethics. When the magazine he worked for in the 1960s took the photographs he had made of ordinary women wearing designer clothes as an occasion for mockery, he quit in indignation. Mockery was the exact opposite of his intent, which was fueled by fascination with the way that women in “ordinary,” middle-class circumstances would adapt the runway creations of designers to the needs of their own lives and the expression of their own individuality. Bill Cunningham’s life exemplifies a true sanctity and love for others, a joyous exuberance, and love for the world. Here’s to him! My favorite writer on spirituality, Thomas Merton was born January 31, 1915 “under the sign of the Water Bearer, in a year of great war, and down in the shadow of some French mountains on the borders of Spain,” as he put it at the beginning of The Seven Storey Mountain, the autobiography that detailed his life’s journey up to age 27 when he entered a Trappist monastery. An autobiography that plunged him into fame just as he retired from the world to one of the more austere Roman Catholic orders and had taken a vow of silence. I first encountered Merton’s writings when I was 27 and in graduate school. Every year just before Christmas, the campus bookstore had a big book sale, and faculty and graduate students got first dibs the night before it opened to undergrads and the general public. In those pre-Amazon days, it was quite the event. We graduate students eagerly looked forward to the invitations that would appear in our mailboxes, entitling us to gorge on books at a reduced price. I don’t remember what exactly drew me to Merton’s autobiography. Perhaps I was vaguely aware of the name, and in any case I had a long-standing fascination with monasticism. In college I heard Samuel Barber’s Hermit Songs for the first time and was immediately taken with both the music and the words, monastic marginalia adapted by poet W.H. Auden. Barber’s setting of the last poem, “Ah, to be all alone, in a little cell, with nobody near me,” is particularly haunting, and his setting of an unknown monk’s ode to his cat, “Panga, white Panga, how happy we are, alone together, scholar and cat,” absolutely delightful, with an accompaniment that manages to be wholly musical while sounding quite like a cat pattering on the piano keys. Like Tolkien, Merton was a Roman Catholic in a Protestant culture, something which must have given each an outsider’s perspective. Like Tolkien, too, Merton’s work reveals great reverence and respect for the natural world, which figures most prominently in his poetry. Merton’s passion for social justice and personal integrity became my guiding principles (not that I can claim to live up to such a model), and his diaries and other autobiographical writings show the struggles all of us experience as human beings trying and failing to lead good lives. They also show specific difficulties of the monastic life such as the struggles Merton experienced in balancing obedience to his superiors with the sometimes conflicting demands of his conscience when he felt obliged to speak out against racism and war. At a time when most religious persons regarded those outside their faith with suspicion or worse, Merton corresponded with Buddhists, Jews, Protestants, and Muslims, eagerly exchanging ideas and taking away much from their traditions that he felt could enrich his own religious practice. 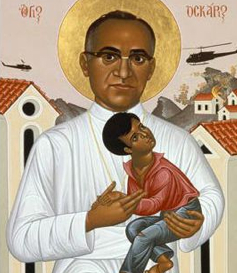 Merton was also, first and foremost, a writer, and I can imagine no better patron saint. 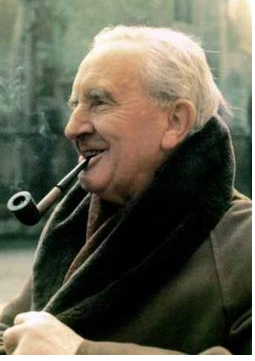 John Ronald Reuel Tolkien was born January 3, 1892, and this is a rather belated birthday tribute, occasioned by a recent viewing of the new Peter Jackson movie (The Hobbit, part 2). I first discovered Tolkien in high school. It was the ’70s, the height of the Tolkien craze, and all the older kids that I admired were heavily into this master of fantasy literature. I bought The Lord of the Rings books one by one, in what I think were the original paperback versions, and I can still remember the anguish with which I finished part 2, “The Two Towers,” where I was left hanging as the dread spider Sheelob nabbed Frodo, and Sam took off with the sword and the Ring. Fortunately, the local bookstore (a B. Dalton’s) had “The Return of the King” in stock, and my nerves were saved. I became another Tolkien fan, and have reread The Lord of the Rings more times than I can count. It never fails to inspire and move me. I didn’t read The Hobbit until much later, and it took me several years to accept it on its own terms, as more of a children’s book, though I am happy to say that I finally came round to liking it for its own sake. Still, The Lord of the Rings will always be my favorite of the two. Back in the day, I eagerly bought The Silmarillion when it came out, and picked up other odds and ends of Tolkieniana from sale tables and used book stores over the years, so that we now own a Tolkien atlas, an oversized book of Tolkien illustrations, a Tolkien Bestiary, and his lovely Father Christmas tale, complete with the charming illustrations. Tolkien’s drawings were every bit as fine as his stories, delicately drafted creations that have quite an elvish flavor about them. I also love photographs of Tolkien himself. A hobbitsy looking man if there ever was one, with all the doughty, understated qualities of a hobbit’s character to boot. His biography makes for fascinating reading. One aspect of Tolkien’s work that I find especially sympathetic is his attitude of reverence and respect for the wonder and beauties of Nature—an attitude that never runs to sentimentality, and is fully aware of the dangers that Nature holds as well (think of Old Man Willow!). The Ents in particular are my absolute favorite of his creations. Treebeard is a marvel, and it tickles my fancy to think that Tolkien modeled Treebeard’s booming delivery on his friend C.S. Lewis, another famous Oxford don who was part of Tolkien’s circle. Every time that I read about some horrible environmental degradation or see a beautiful, healthy tree wantonly chopped down in a neighborhood yard, I have a fierce longing to evoke the vengeance of the Ents upon the offender, wishing that I could call upon the mighty shepherds and defenders of trees to mow down these destroyers of beauty as they mowed down Saruman’s nasty little fiefdom. Like the evil wizard, too many people these days possess “minds made of metal and wheels” as Tolkien so aptly put it—completely blind to the beauties of the natural world. The religious aspects of The Lord of the Rings are woven into the tale with equal subtlety. The moral growth of Frodo and Sam that leads to their sacrificial journey to Mordor, the wisdom of Gandolf, Galadriel, and Aragorn, and the beauteous vision of Tolkien’s Elves all lend themselves to our moral and religious stories, no matter what our faith. 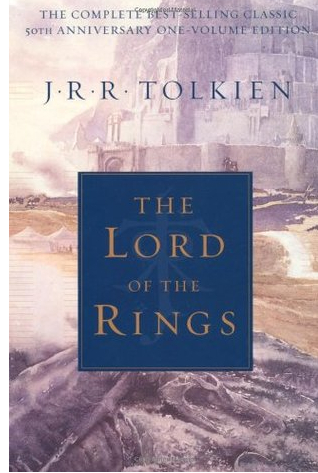 The Lord of the Rings is truly a timeless and universal tale, and Tolkien a towering literary saint. 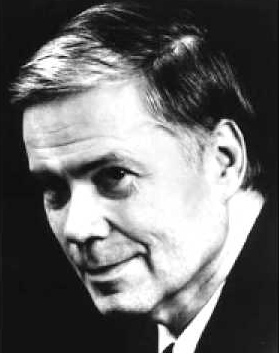 My all-time favorite singer, baritone Dietrich Fischer-Dieskau, died two weeks ago, on Friday May 18 at the age of 86. I can’t remember precisely when I first heard his recordings. I was bitten by the opera bug during my senior year in high school, and in college, listening to student recitals, I discovered that I loved art-songs (lieder), as well. One of my favorite professors was a huge admirer of Mahler, a composer I’d never heard of till then, and I think the first Fischer-Dieskau recording I purchased was most likely an album of Mahler songs with orchestra. His voice was like velvet and molten gold, his technique and control extraordinary. He could breathe a barely audible whisper of sound or soar into a full-bodied swell that was never rough or stentorian. But what really drew me was the emotional depth of his singing. This was due in part to his care with words, but also to the musical shading and nuance he brought to every phrase. We’re fortunate that he recorded extensively. His Don Giovanni purrs with soft, swoon-inducing seduction, his Schubertian heroes pour forth their stories with pathos, his Mahler reaches the heights of religious ecstasy. The ending of Mahler’s Das Lied von der Erde (The Song of the Earth) is one of the most beautiful passages in all music, and especially fitting as a memorial because the subtext of final section, “Der Abschied” (The Farewell), is death It is moving without being morbid, giving a vision of rebirth as well as sorrow, and Dietrich Fischer-Dieskau’s performance always moves me to tears. He alighted from his horse and handed him The drink of farewell. And also why it had to be. I am going to wander in the mountains. I seek rest for my lonely heart. I journey to the homeland, to my resting-place. I shall never again go seeking the far distance. My heart is still and awaits its hour! Blossoms in spring and grows green again! Everywhere and forever the distance shines bright and blue!